About this interview. 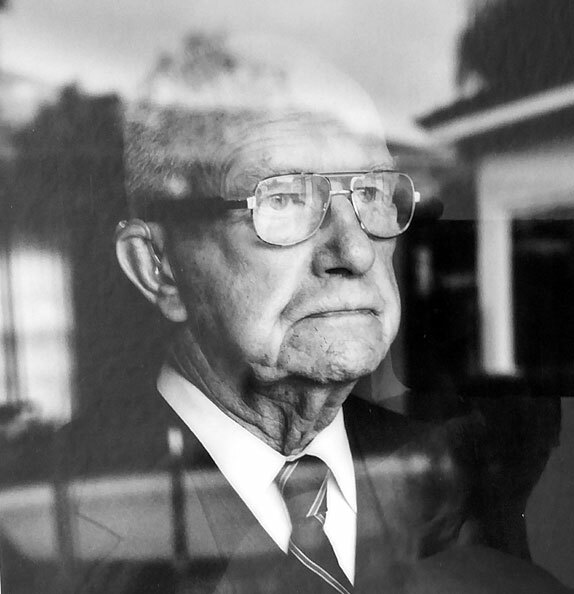 This portrait and interview — believed to be R. Buckminster Fuller’s last– was conducted by John Gerstner at Fuller’s home in Pacific Palisades, California, in November, 1982. Fuller died on July 1st 1983 at the age of 88. His wife, Anne, died just 36 hours later, on July 3rd, one week before their 67thanniversary. What is so remarkable to this day is the unflinching optimism and prescient foresight that Fuller practiced until his death. Although he spoke the words in this interview more than 20 years ago, the messages for humanity still ring amazingly true. This interview of Fuller was first published in the Spring 1983 10thanniversay issue of JD Journal, the corporate magazine of John Deere. 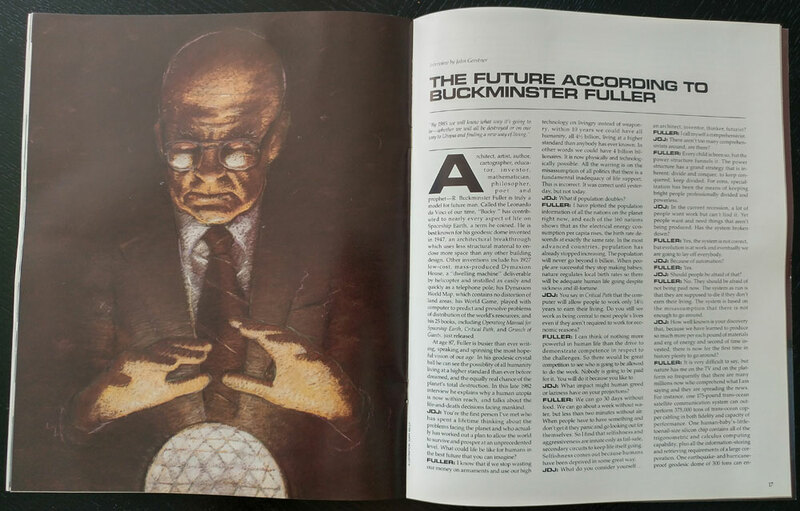 Educator, inventor, mathematician, philosopher, poet and prophet … R. Buckminster Fuller is truly a model for future man. Called the Leonardo da Vinci of our time, “Bucky” has contributed to nearly every aspect of life on Spaceship Earth, a term he coined. He is best known for his geodesic dome invented in 1947, an architectural breakthrough which uses less structural material to enclose more space than any other building design. Other inventions include his 1927 low-cost, mass-produced Dymaxion House, a “dwelling machine” deliverably by helicopter and installed as easily and quickly as a telephone pole; his Dymaxion Wolrd Map, which contains no distortion of land areas; his World Game, played with computer to predict and presolve problems of distribution of the world’s resources; and his 25 books, includingOperating Manual for Spaceship Earth, Critical Path, and Grunch of Giants, just released (in 1982). At age 87, Fuller is busier than ever writing, speaking and spinning the most hopeful vision of our age. In his geodesic crystal ball he can see the possibility of all humanity living at a higher standard than ever before dreamed, and the equally real chance of the planet’s total destruction. In this late 1982 interview he explains why a human utopia is now within reach, and talks about the life-and-death decisions facing mankind. GERSTNER: You’re the first person I’ve met who has spent a lifetime thinking about the problems facing the planet and who actually has worked out a plan to allow the world to survive and prosper at an unprecedented level. What could life be like for humans in the best future that you can imagine? GERSTNER: You say in Critical Path that the computer will allow people to work only 141/2 years to earn their living. Do you still see work as being central to most people’s lives even if they aren’t required to work for economic reasons? FULLER: We can go 30 days without food. We can go about a week without water, but less than two minutes without air. When people have to have something and don’t get it they panic and go looking out for themselves. So I find that selfishness and aggressiveness are innate only as fail-safe secondary circuits to keep life itself going. Selfishness comes out because humans have been deprived in some great way. GERSTNER: There aren’t too many comprehensivists around, are there? GERSTNER: In the current recession, a lot of people want work but can’t find it. Yet people want and need things that aren’t being produced. Has the system broken down? FULLER: No. They should be afraid of not being paid now. The system as run is that they are supposed to die if they don’t earn their living. The system is based on the misassumption that there is not enough to go around. FULLER: It is very difficult to say, but nature has me on the TV and on the plat- form so frequently that there are many millions now who comprehend what I am saying and they are spreading the news. For instance, one 175-pound trans-ocean satellite communication system can out-perform 375,000 tons of trans-ocean copper cabling in both fidelity and capacity of performance. One human-baby’s-little- toenail-size silicon chip contains all of the trigonometric and calculus computing capability, plus all the information-storing and retrieving requirements of a large corporation. One earthquake- and hurricane- proof geodesic dome of 300 tons can enclose the same volume of space as that of the 80,000-ton Queen Mary, or the circa-l-million-ton cathedral Notre Dame. So narrowly focused are the specialists’ scientists who make the more-with-less technology breakthroughs that they do not see the synergetic significance of their individual gains along with the myriads of others which altogether now make possible the physical success of all humanity, the obsolescence of all politics, and replacement by a world-embracing, selfishly incorruptible, electronic democracy. FULLER: It’s very touch-and-go as to whether the news that there is enough for everybody can get around fast enough. The invisible technology that people don’t understand is their only means of exercising their option to make it on this planet. I say 1985 is the critical year. It’s right at hand. In other words, within the next two or three years we will know whether humans are going to stay on this planet or not. FULLER: That is nothing. That is a mess man has got to get rid of. It is clear as can be that up to now monev makes the most money with weapons. The big rnoney has to keep their media saving that Russia is a threat in order to warrant spending all these billions of the people’s money. I am sorry to say it is rather a mean picture. Russia has no interest whatsoever in destroying us. After World War II when we officially turned against Russia, the Russian leaders were all wearing peasant clothes. They’re not wearing them anymore, because thev discovered that evolution had introduced a completely different revolution… a revolution of benignly pulling the bottom up instead of revengefully pulling the top down. The USSR is intent on comprehensive disarmament so that thev can turn their industrial productivity on their people which the arms race frustrates. That means that the United States doesn’t have anything to worry about in Russia. The best thing to worry about is evervbody’s standard of living. it’s a very tough one, but everybody has to be a billionaire. FULLER: The way it’s going to occur is that the power structure is getting itself all involved with money, and monevy is not wealth. And thev have been stretching it bevond its popular credibility. Mv book Operating Manual for Spaceship Earth is the most popular English-language book in China now. It describes and differentiates between wealth and money. I make it clear that wealth is everything that humanity has accomplished to take care of a given number of humans for a given number of forward calendar days. This wealth is basically of two kinds. The first one is phvsical–the walls that keep you warm, clothing, food, etc. Anvthing that is phvsical is energy and it is agreed bv scientists from the beginning of this centurv that energy cannot be created or destroyed. The other component of wealth is the know-how, the metaphysical, the discoverv of cosmic principles by the mind and the ability to use them. The very extraordinary thing about the metaphysical know-how is that every time we use it, we alwavs learn more; you cannot learn less. Since the phvsical part cannot decrease and the metaphysical can only increase, wealth is something that can only increase–it’s very exciting. So we are in an incredible position todav with all these banks around. Every building is a bank. And everyone is playing games with our money there, and increasing interest rates. The big power structure today is really going to be in trouble. The United States government is completely bust. It can’t pay the interest on its debt. To be talking about buying armaments is preposterous. GERSTNER: You say that the 160 nations of the world act as 166 blood clots blocking the free and unobstructed exchange of ideas, scrap metals, tools, and real wealth. But isn’t it hard to imagine the world’s people giving up their strong nationalistic instincts? FULLER: No, it isn’t. I have been around the world 48 times. The United States isn’t a nation. It is a crossbreeding world of humans. In one section of Los Angeles there are 81 nations’ people interbreeding. In honor of the 50th anniversary of Buckminster Fuller’s patent for the geodesic dome, the U.S. Postal Service issued theseBuckminster Fuller Commemorative stamps in the fall of 2004. The image is based on a Time magazine cover illustration by Boris Artzybasheff. On the back of each stamp is this text: “Renouned as the mind behind the geodesic dome, R. Buckminster Fuller (1895-1983) was an inventor, architect, engineer designer, geometrician, cartographer, and philosopher. 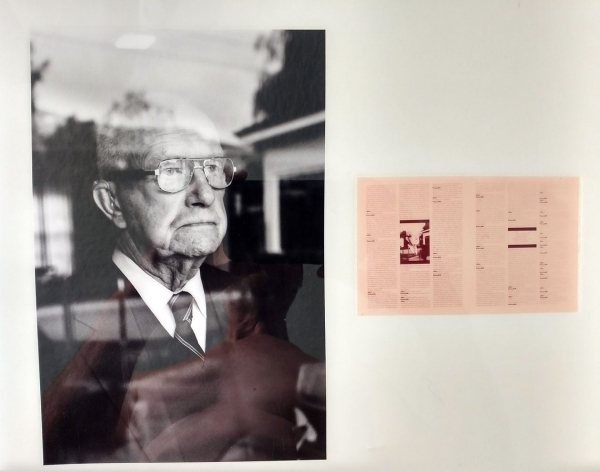 His pioneering solutions to the world’s problems reflected his commitment to using innovative design to improve human lives.” You can learn more a man ahead of his time, R. Buckminster Fuller, at the Buckminster Fuller Institute. GERSTNER: What has been the most important invention in your lifetime? FULLER: I was born in 1895. Reality when I was born was everything you could see, smell, touch and hear. The year I was born, X-rays were discovered and Marconi invented the wireless. When I was 3 vears old, the electron was isolated. When I was at Harvard, in the back of my physics book there were some yellow pages that had been glued in called “electricity.” From that time on, technology disappeared completely into the invisible reality of alloys, chemistries, electronics. Today, 99.999 percent of everything that is going to affect all our tomorrows is being conducted in the realm of reality non-contactible bv the human senses. It’s a completely different game. We’ve actually million-folded the realms of reality that we employ. Until I was 28, we knew astronomically only of the Milky Way. When I was 28, Hubble discovered another galaxy. Wow! Up to two weeks ago we had discovered two billion galaxies and two weeks ago we discovered another 200 billion galaxies. That gives you an idea of the magnitudes in the rate of acceleration now characterizing all human affairs. GERSTNER: We are then greatly advanced from when you were born. FULLER: When I was born, humanity on our planet was 95 percent illiterate. Today humanity is 65 percent literate. The average six-year-old now has a vocabulary of 5,000 words. The average workman when I was voung had only 100 words. They mainly talked the way they spat. GERSTNER: Should we legitimately fear intelligent machines taking over? FULLER: Absolutely not. I differentiate between brain and mind. Machines can do what our brains do. The brains of all creatures are alwavs and onlv recording and integrating the information of our senses — smelling, seeing, touching, hearing. We find then the human mind from time to time discovering a mathematical relationship that is purely intellectual and can onlv be expressed that way. There’s an intellectual integrity operating in the universe. The human mind has some access to the great design of the universe. No other creature has it nor can employ this information objectively. Wow! This means that we humans are here for some very important reasons which we have not as yet come to think out publicly. I made the working assumption that we are here as local Universe information-gatherers, and local Universe problem-solvers in support of the integrity of an eternally regenerative Universe. GERSTNER: So the mind makes the diifference? FULLER: We are completely metaphysical. We’re not our body. At mv age, I have consumed over 300 tons of food, air and water that became temporarily, my hair, flesh and bones, and I am sure that’s not me. We’re not physical. What is unique about humans is this mind thing. GERSTNER: In 1927, at age 32, you decided to make vour life into a scientific experiment to see what–if anvthing–one average human could do to improve the support and success of all human life aboard Spaceship Earth, and not for monetary reasons. Is this something that you would expect other people to do? FULLER: No. Most people assume that you have to earn a living. That’s what is drilled into them. And I made up my mind to run this experiment to see what would happen if you paid no attention to that, and only concentrated on trying to help man-kind succeed on the planet. I saw that the grass didn’t have to pay the clouds to rain, and that all the money business was a very small game. GERSTNER: And you’d recommend this? FULLER: I never give advice to others. I am saving that humans are a verv good invention and I’d like to develop the environmental artifacts that will complement them. If I’m doing that, if I’m doing what the Universe would like me to do — trying to make humans a success, then I’ll survive. And I have. I’ve really experienced miracles. GERSTNER: Are you worried about a nuclear holocaust? FULLER: Yes. There are an enormous number of short-sighted, selfish people who think they can get away with limited nuclear bomb warfare. And if anybody starts one they are all going to go off automatically due to the automation of the electronic alerting svstem. So we are in constant peril. I call it absolute peril. We have the capability of making it now but we are on touch and go. By 1985 we will know what way it’s going to be — whether we will all be destroyed or on our way to Utopia and finding a new way of living. How has it happened that the great questions of where we are going are all being handled bv politicians? It goes back to Thomas Malthus and the rise of the British Empire. In 1805, compiling data for the first fime on a closed, spherical system, he concluded that life-support capability was increasing at only an arithmetical rate and population was increasing geometrically. Therefore, only a few humans were destined to survive successfully. So the working assumption of all political economics is that there is not enough to go around which is now actually invalid. So politics are all invalid. War is obsolete. We may be able to see some sort of sweeping way in which it becomes evident that the authority is plaving only money-making games with those bombs and so forth. But it will take some time. Things are happening, but we don’t have any instant babies. The biggest things take the longest. GERSTNER: Did you say that there may be some supernatural impact or event that would affect our decision as to whether we go toward weaponry or livingry? FULLER: No, only supernatural to the extent that we have a majority who are literate and doing their own thinking. Doing what I call discovering their own access to the great intellect governing Universe. I think that, next to the atomic bombs, the most dangerous things on our planet today are the organized religions … each one saying they have a monopoly on access to God and to heaven. They get people worked up and start the fires going. I find the great antibody to this is the young people making their own discoveries and doing their own thinking. I say everybody has their own hotline to God. I say humans as an invention are in final exam. Is the individual human able to demonstrate enough intellectual courage and integrity to justify his divine insights? Are humans going to be able to constructively and livingly use their beautiful minds and the cosmic laws to which we all have access? If they do, we’ll make it. This is the big test. GERSTNER: But 1985 is so near. FULLER: More will happen between now and 1985 than has happened in the whole of history up to now. Changes are coming that fast. GERSTNER: Wouldn’t your Dymaxion House imply that we would all be living in the same house? Doesn’t this conformity go against the grain of individuals? FULLER: Do you want three eyes and five nostrils? You have been living in a very standard device for a long time–the human organism. The more the technological uniformity, the more individuality is free to articulate. GERSTNER: Education plays such a key role. What needs to happen to improve our current educational system? FULLER: Get rid of it. GERSTNER: Replace it with video? FULLER: Video and computer. You don’t go into Grand Central Station to study. You go to your own home. And then you can come together for social experience. GERSTNER: What recommendations do you have for people to prepare for the future? GERSTNER: Do you believe in an afterlife? FULLER: I don’t believe in anything. But it’s obvious there could be. I say we are not physical: whatever we are is metaphysical. Whatever we are doesn’t die when our body dies. Life is not this body. GERSTNER: You speculate that man arrived on the planet fully developed? FULLER: I think it is a very reasonable assumption, yes. GERSTNER: Does that imply that he might have been sent here by another intelligent force? FULLER: Yes. It’s very probable. GERSTNER: So you have no difficulty in accepting the idea that there are many other life forms on many other planets? FULLER: No. They won’t look like us unless they come from the particular kind of biosphere we have. Humans consist 60 percent of water. Water freezes and boils within close limits. GERSTNER: Do you expect us to inhabit space? FULLER. That’s all we’ve ever done. We’re on a very lonely little spaceship. GERSTNER: Do you expect us to inhabit other little space ships? FULLER: We’ve already done it. GERSTNER: Are you convinced that your work will go on after you? FULLER: I certainly don’t do it for that purpose. I’m eager to help my fellow humans appreciate some of the extraordinary conditions under which we are conceived and developed. GERSTNER: But you’re not intending to change the world? FULLER: I never try to in any way. I don’t try to outguess God. GERSTNER: Are you an optimist? FULLER: No. To discover that we have an option to render all humanity physically successful is not to be optimistic. I think it is absolutely touch-and-go.